Service Costs > How Much Does a Notary Cost? A notary is a third-party professional that is authorized by the public to perform certain legal procedures such as witnessing a signature or even certifying documents. Documents commonly notarized include wills, trusts, deeds, contracts and affidavits. The cost of a notary will really depend on the company, the amount of work that may have to be done and local state laws. On average, a notary public signature is going to anywhere from $0 to as much as $20 if you were to come to their location. More than likely, you will find that your local bank, such as Bank of America and Wells Fargo, will notarize something for free as long as you are a customer of that particular bank and they have a notary on staff. Public companies, such as FedEx Kinkos and the UPS Store, usually charge around $5 to $10 to have a single-page document notarized. Some UPS stores and professionals may charge $3 to $7 per seal. For example, SFBayNotary.com charges $5 per every notarized signature. TheBalance.com says the average notarial charge will be in the $2 to $20 range. Now, if you needed a notary to come to your location, a mobile notary could charge anywhere from $25 to $45 for the first two signatures as long as you were within 15 to 20 miles. For every additional document, plan on adding another $5 to $10 per notarization. Before the documents are signed, the notary will need to see identification from every party signing, and each individual must be physically present before a signature can be notarized. If you fail to show your identification, the notary will not be able to notarize the documents since your ID will not match the signatures on the documents. Depending on the document, a notary will be able to witness you sign documents and help you sign documents. This includes helping to explain what exactly you are signing and why it is important. Before the documents are signed, the notary will review it to make sure that everything is in order. Once the documents have been signed, a notary will stamp his seal of approval, along with his notarized signature. The signature label will have a seal that proves you went to a notary public. This will make your documents more official and more likely to hold up in court if that is ever necessary. If copies have to be made, this can be anywhere from $0.10 to $0.30 per copy. If more than one page has to be notarized, additional fees can apply. If you are going to go to your bank, be sure to call ahead of time. You may find that some notaries are only there certain times of the week or are only available by appointment. 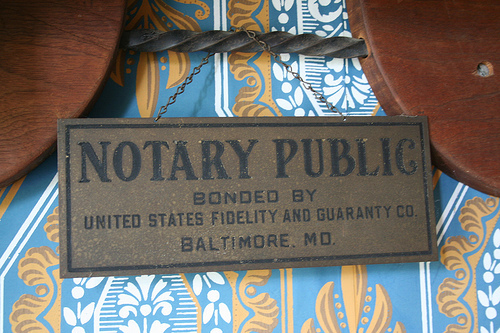 Some states limit the fees that can be charged by the notary public. Make sure that you know your state’s laws so that you are not ripped off by being charged too much. Punny.org and the National Notary Association has a list of the maximums a notary can charge in that state. If you have been charged too much, contact your state to report the notaries office. If you plan on having the notary coming ahead of time and traveling, make sure that you get the fees ahead of time. By knowing the fees ahead of time, you will not be surprised with any unexpected charges. Some notaries may not be able to notarize some documents. For example, some UPS stores won’t be able to notarize an I-9 Employment Eligibility Verification form. Always contact ahead of time to make sure they can notarize your documents. Don’t know where to find a notary? The American Society of Notaries has a notary locator on its official website. As mentioned above, head to your local bank to have something notarized. Most of the time, they will be more than happy to do this for nothing. If you are not a customer of a local bank, many local UPS stores can perform the job as well for a slight fee. Your local UPS store should be able to do it for less than $10. Ask around. You may be surprised at who may be a notary.